Lately I have been doing a lot of knitting! 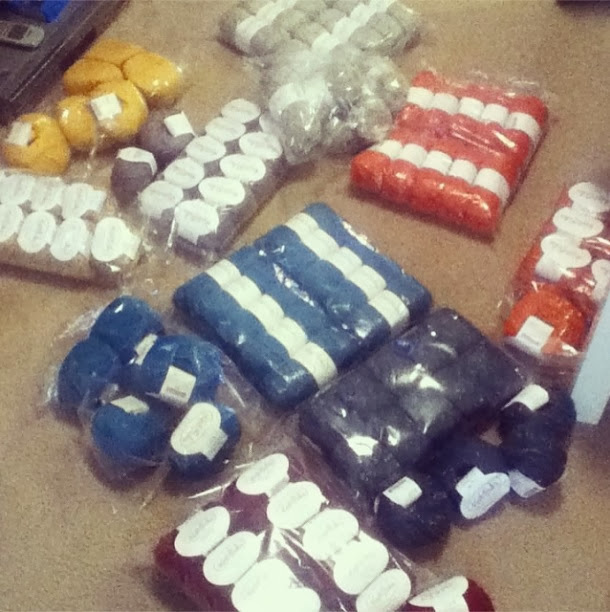 I brought my knitting machine home for break, along with, um, over 100 balls of yarn. When Knitpicks had their Thanksgiving week sale, I splurged and bought pretty much all the yarn I will need for my senior collection. It was a huge purchase, but I am so excited to use these luxury yarns. Fiber snob and proud of it! Here's some proof from after I opened the box. This isn't even all of it! But I just counted 99 balls in this picture alone so I guess it's close. It's just so much yarn. But I'm starting to make my way through it, believe it or not! So this is the latest project/ I learned how to do these cute little triangles on my machine, and paired them along with a staghorn aran cable and two braided cables. Lots of counting and keeping track of my place and catching mistakes! I don't even know what I would do without my knitting machine. Maybe I'll post all about it sometime this month in case someone is interested in getting one? They are amazing tools with insane capabilities. 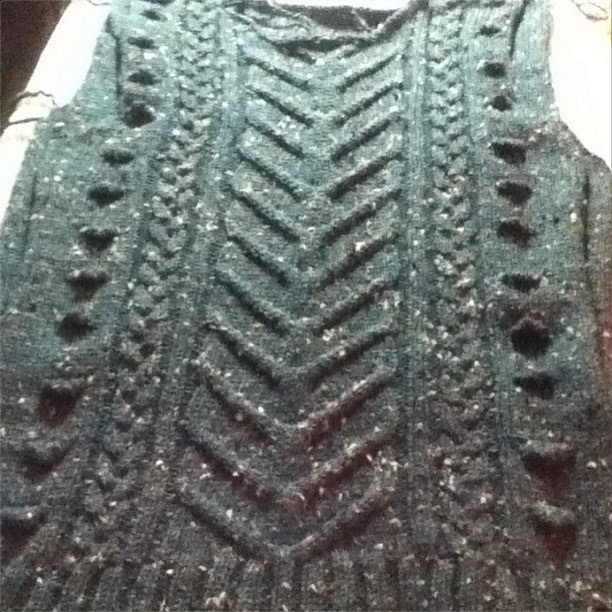 It still takes a good amount of time to knit something like the sweater above, due to the amount of hand manipulated stitches, but it still speeds things up from hand knitting. By the way, this is Knitpicks City Tweed yarn, in the Jacquard colorway. The photo isn't true to color, but I'll try to get some better photos in natural lighting with a real camera soon! The yarn itself is some of my favorite to work with. I used it on my last sweater, and it's just a luscious blend of merino and alpaca. The neps add so much visual interest and it's a joy to work with and to wear! so pretty! and its so amazing you can do all that with a machine. I really want one but can't afford one right now! so its by hand for me! Thanks, Carolynn! You do some pretty incredible work by hand!! Machines can be pricey, but sometimes they show up for under $200, which is a great deal... and occasionally, people give them away because they don't know what they are! You could try asking around, maybe some older church ladies or family friends might have one stashed under a bed or tucked away in a garage. I have friends who have gotten machines that way, since they were mostly made in the 60s and 70s and are rarely used now, people do sometimes have have them lying around! Intarsia Triangles WIP - Part 2!